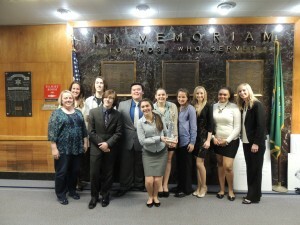 From left: Jennifer O’Boyle, Sarah Saunders, Andrew Galloway, Ian Mount, Kyle Conner, Tyra Velasco, Taylor Reuter, Jacynda Hoyson, Cheyenne Stefan, Abrynaa Johnson, Ashley Armstrong. Not pictured: Alyssa Barnes, Chaisten Wiegel. Kitsap’s YMCA Mock Trial team took second place Saturday during the district competition, finishing between Port Townsend High School’s two teams. The team chalked it up to a moral victory, considering the group formed late and had to make up their team from two high schools, Klahowya Secondary School and Bremerton High School. Plus, the team produced the Best Witness, as selected by jurors. Jacynda Hoyson, a senior at Klahowya, testified for the prosecution as a streetwise detective. Although the mock trials allows student to practice practicing law, the skills that go into making and defending a strong case are valued in most careers. Logic, writing, public speaking, teamwork, strategic and critical thinking are useful in just about every field. The team’s coaches, Central Kitsap attorneys Ashley Armstrong and Stacey Saunders, believe next year will see more teams and more prepared teams. This year the competition team was not formed until after the Christmas break. The team also received two nominations. Ian Mount, Klahowya, was a runner up for best attorney, and Andrew Galloway, Klahowya, was up for best witness.